Maruti Suzuki has unveiled the facelift of the Baleno RS. Much like the standard Baleno, the updates to the RS are purely aesthetic in nature. There’s a new front bumper with a wider airdam, and larger fog lamp enclosures that add a splash of sportiness to the design. The wider grille has been carried over, but it now features honeycomb detailing. Similar detailing can be spotted on the bumper as well. Other changes include LED projector headlamps (instead of bi-xenons), new machine-finished alloy wheels and a new 7-inch touchscreen that debuted in the 2019 WagonR. Mechanically, the Baleno RS remains unchanged — carrying forward the 102PS/150Nm 1.0-litre turbocharged mill. Over the standard Baleno, the RS gets rear disc brakes as well. Maruti Baleno RS prices start at Rs. 8.77 lakh (Ex-Showroom). Maruti Baleno RS is available in 1 variants and 7 colours. Share your experiences with Baleno RS? The claimed ARAI mileage for the Maruti Baleno RS petrol is 21 kmpl. Q. Which is best new Ertiga or Baleno RS? Q. Will Baleno RS be safer? Will it absorb more impacts without affecting occupants? Q. Does after turning on the AC will affect pick-up of the car? Yes, while turning on the A/C the pick up of the car affects. As the direct effect comes on the engine only. Q. How is overall performance of Baleno RS as compared to Polo GT TSI? Baleno RS is good for nothing car. Go blindly for Polo GT TDI. Why go for petrol if you get a GT diesel. Q. Is Baleno RS worthier to buy? because I expect more performance as well as safety. I heard that RS is more heavier than its regular cousin. Q. Which one is best, Tata Nexon XZ or Maruti Baleno RS? 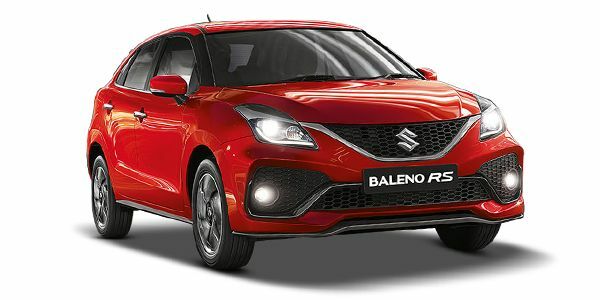 Maruti Suzuki launched the Baleno RS in 2017 to satisfy enthusiasts who were demanding for a sportier and more powerful version of the hatchback. The Baleno RS comes with a smaller 1.0-litre engine, albeit with a turbocharger, to produce 102PS of power, which is 18PS more than the regular petrol variant. Additionally, all four wheels were given disc brakes while the body received bits and bobs to make it look sportier than the regular hatchback. Currently, the Baleno RS is priced at Rs 8.4 lakh (ex-showroom Delhi), which is roughly around Rs 1.1 lakh more than the Alpha petrol-manual variant of the hatchback. Maruti’s Baleno RS doesn’t look drastically different when compared to the standard version. The manufacturer has chosen to keep it subtle with a body kit, which includes bumper lips at the front and rear along with side skirts. The rear bumper is completely different, and it does look sportier. Coming to the wheels, the RS uses the same set of 16-inch alloy wheels found on the Baleno, but they get a gun-metal finish here. The other subtle difference is in the detailing of the grille - where the Baleno gets slats, the RS features a mesh pattern. Since the RS is based on the Alpha variant, the cabin is identical. Maruti Suzuki could’ve (and should’ve) spiced things up a bit here by using colour-coded stitching or even interior panels matched to the body paint, but that’s not the case. There’s no change at all, which means it’s a sea of black accentuated by dull silver accents. In terms of features, the RS gets a height- and reach-adjustable the steering wheel, a 7-inch touchscreen infotainment system with Android Auto, Apple CarPlay and in-built navigation, automatic climate control, a reverse camera, steering-mounted controls and a fancy multi-coloured display in the instrument cluster that shows the amount of power and torque being used at any given point of time. Like the regular hatchback, the RS gets anti-lock brakes (ABS) and dual front airbags as standard. What makes the RS special is its engine. It is powered by a 1.0-litre turbocharged petrol motor that produces 102PS of max power and 150Nm of peak torque. It comes mated to a 5-speed manual gearbox. This combination returns a claimed mileage of 21.1kmpl. Since the car weighs just 950kg, the result of all this is a hatchback that’s a lot of fun to drive. That said, it isn’t a whole lot different when compared to the regular Baleno petrol. 0-100kmph is dealt with in 10.52 seconds, and the in-gear acceleration (30-80kmph in third) is quite brisk at 7.02 seconds as well. The turbo-petrol engine is frugal when driven sanely too. During our test it delivered 15.35kmpl inside the city and 20.80kmpl on the highway. The Maruti-Suzuki Baleno RS is a standalone variant that is based on the Alpha trim. If you want the RS, this is your only option. Volkswagen Polo GT TSI: Possibly the best petrol hot hatch you can buy without draining your wallet. The slick 7-speed DSG exploits the 105 horses very well, and it’s fun to chuck around the twisties too. Ford Figo S: The Ford Figo equipped with the 1.5-litre diesel motor that produces 100PS of power and 215Nm of peak torque is a worthy competitor to the Baleno RS. Apart from the ‘S’ badge, this variant also gets a revised suspension, which makes it one of the most fun-to-drive diesel hatchbacks south of Rs 10 lakh. If you are looking for a 100PS hatchback, the Baleno RS makes a strong case for itself. Its well priced, well equipped and is genuinely fun to drive. It is backed by Maruti Suzuki’s reputation for reliability, low running cost and massive service network. Thus, the Baleno RS strikes a good balance between everyday usability and fun driving experience. Spacious , light and nimble, Power packed performance with a turbocharger and trustworthy Maruti Suzuki service network. Confused about Maruti Suzuki Baleno RS?